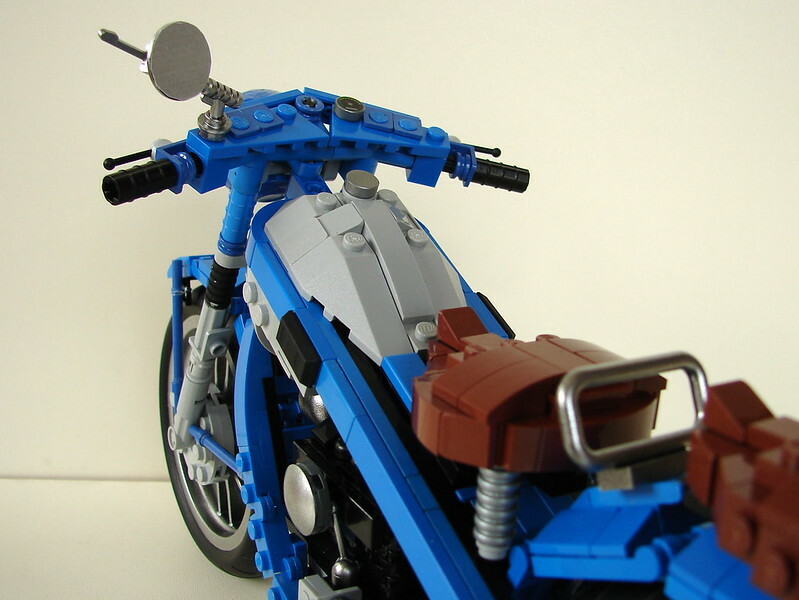 LEGO models my own creation MOCpages toys shop Nimbus motorbike. 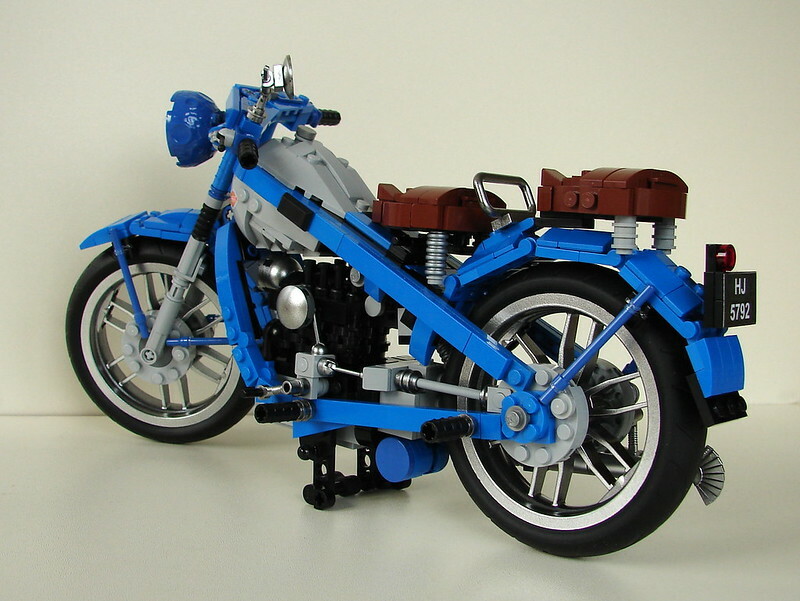 LEGO version of the Danish Nimbus motorbike, a Technic and System combination model. 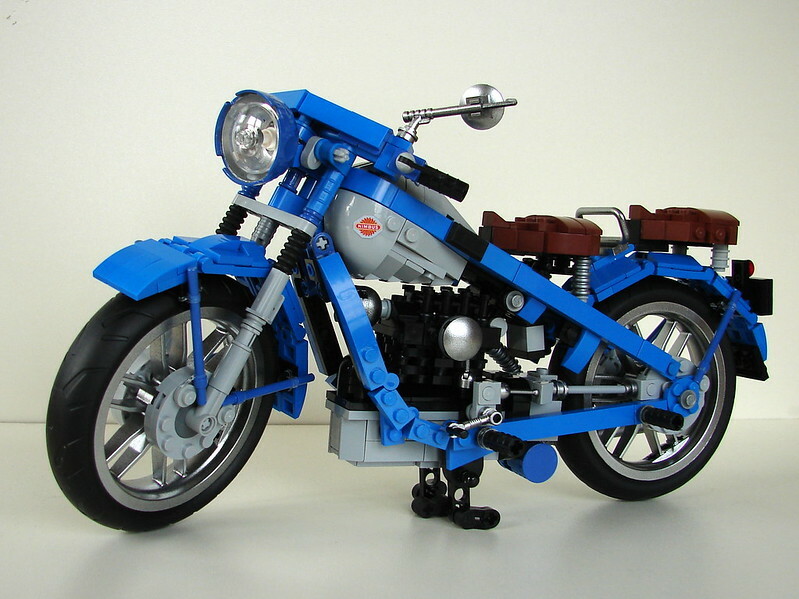 My latest Lego motorbike, the Danish Nimbus motorbike, has been an even bigger challenge than my other motorbikes. 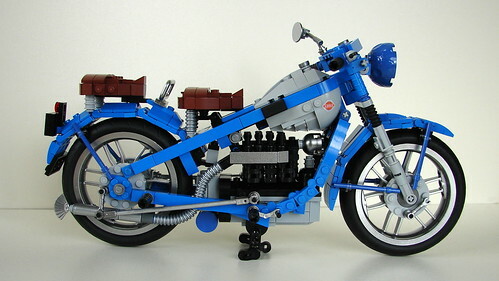 The tricky part, compared to my other motorbikes, is the fact that I couldn`t build it around an actual Technic frame. Because the frame of the real bike, consist of welded flat iron with a strong triangular shape, and I wanted this particular frame-look, I�ve replicated it in plates and hinges, and it`s much more fragile than a Technic frame. A few Technic beams hides inside the gastank to join the frame and the front wheel fork. 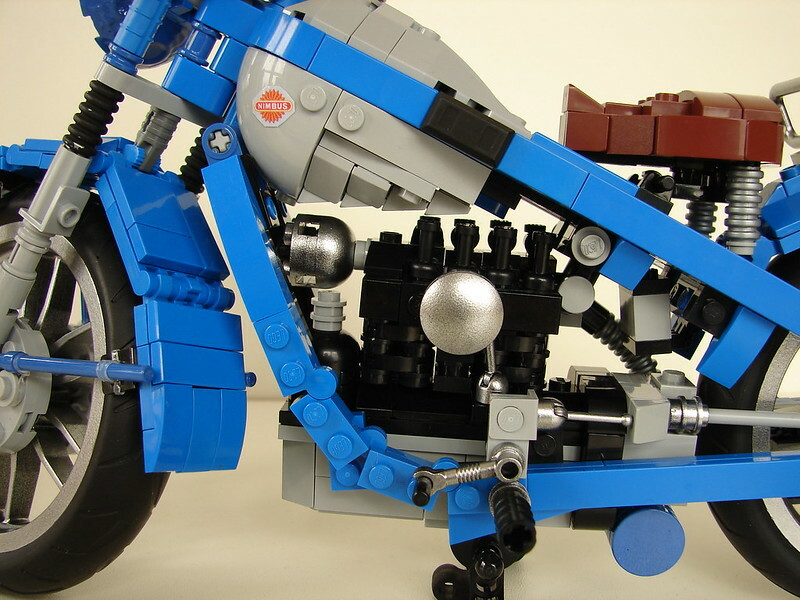 The engine itself is also a vital part of the bikes structural integrity, and is joined with the frame in four points at the oil pan, and with a Technic connector at the rear cylinder. 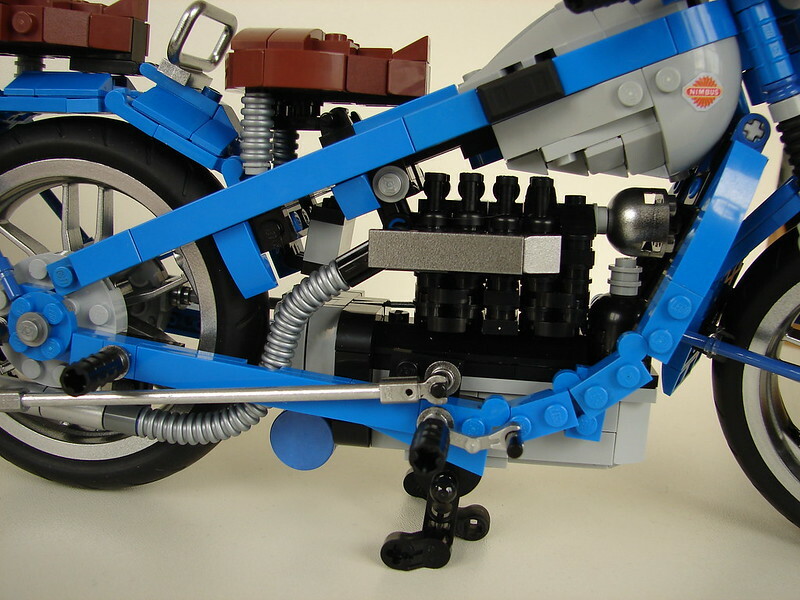 This way everything holds nicely together, and the bike is sturdy enough for handling during the building process. I feared a nightmare where parts kept falling off. Although a pair of 3D printed, custom made, wheel fenders probably would have looked better, I didn`t fell for the temptation of doing so. Actually I�m quite happy with the way my brickbuilt fenders turned out, especially after I added the bracing. It was a rather fiddly job to add these by use of small transparent silicon rubberbands, but absolutely worth the effort. Like my previous bikes, this one also contains a number of painted parts; wheels, rear view mirror, brakepedal, headlamp etc. For anyone interested in the history of this great Danish bike, the www is a great source of information. A nice little exstra Christmas gift, to see my Nimbus blogged by The Lego Car Blog! Hej Jacob F! Tak for kommentarerne, og undskyld min sene reaktion. Jeg m� desv�rre skuffe dig. I forbindelse med overdragelsen af min model til Nimbus museet, afslog jeg at seriefremstille den med salg for �je, da det er ret omfattende og tidskr�vende at skaffe dele til s�dan en model. Jeg deler heller kke byggevejledninger, da der i den seneste tid er dukket piratkopier af andre modlbyggeres v�rker op, uden deres tilladelse. Disse modeller s�lges p� nettet uden anerkendelse eller udbytte til modelbyggeren. Quoting Scott Bertaut Insane! My brain can't really comprehend how awesome this is to say more then that, too much detail. Epic job! Thanks again Scott, it`s very much appreciated! Insane! My brain can't really comprehend how awesome this is to say more then that, too much detail. Epic job! Hej Ole! Tak for henvendelsen, Jeg har f�rst set din kommentar i dag. Det lyder meget interessant. Jeg sender dig en mail senere! Quoting Clayton Marchetti Wow! This is positively beautiful! A real masterpiece! Thank you very much Clayton, and pardon me for the late response! Wow! This is positively beautiful! A real masterpiece! Quoting C.K. Yee Happy new year for my lego friend, the past few months i was really busy of work until i had no time to build any of my new model. I really impress of your new motorbike and the best is you capture every part nice details. It really well build. Thank you so much my friend, for this delightful New Year comment! 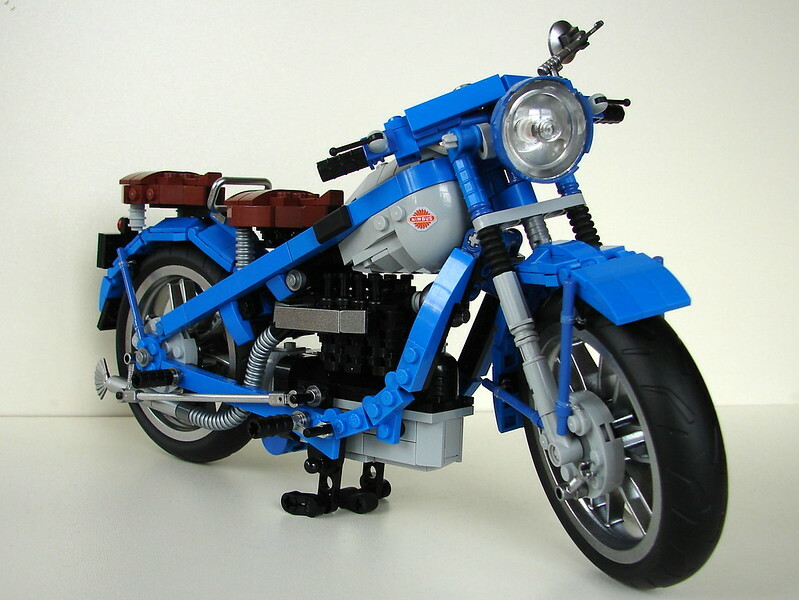 Too bad when work steals your precious spare-time, but of course we have to earn more money to bye more LEGO :-) I`m really glad you like my Nimbus motorbike, I wish you all the best for the New Year! Happy new year for my lego friend, the past few months i was really busy of work until i had no time to build any of my new model. I really impress of your new motorbike and the best is you capture every part nice details. It really well build. Quoting James Dart Excellent job. I really like this build. Excellent job. I really like this build. Quoting Sven ;o) Yes my friend, agree ;o) Like I said before, do the same from time to time. Congrats on beeing blogged. Yes my friend, agree ;o) Like I said before, do the same from time to time. Congrats on beeing blogged. Thank you very much Andrea, I`m glad you like it! Quoting Nick Barrett This is just amazing - so beautiful, and I'm glad you went with brick-built fenders. Perfect in every little detail, I can stare at this for hours! 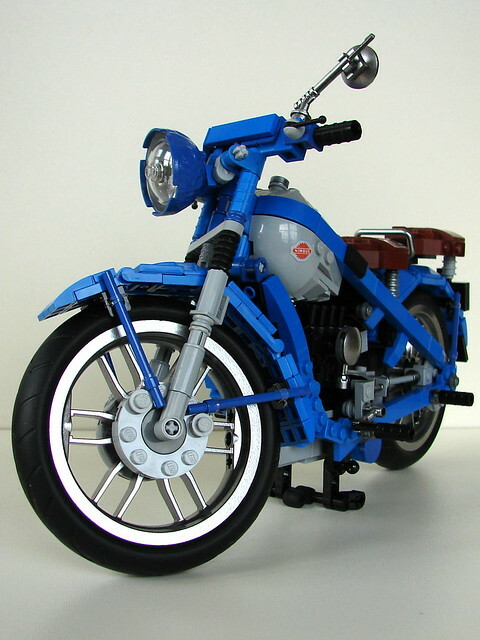 Thank you very much Nick, it was definitely the right decision to make the brick-built fenders, and I�m glad I did. Sounds like you also have a soft spot for vintage motorbikes, so please go ahead, and stare as much as you like! 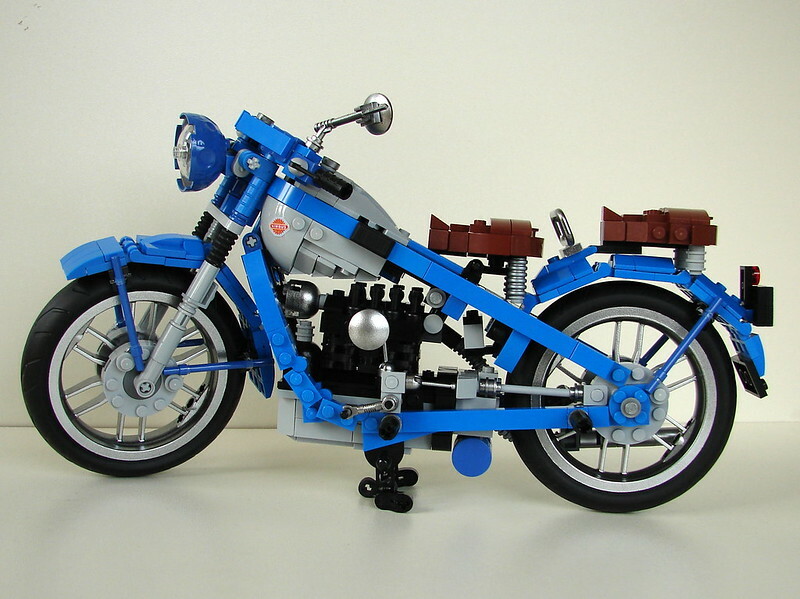 This is just amazing - so beautiful, and I'm glad you went with brick-built fenders. Perfect in every little detail, I can stare at this for hours! Quoting Oran Cruzen Congratulations Henrik, this jewel vroom'd to number one on Most Discussed! That`s great, thanks for letting me know Oran! Congratulations Henrik, this jewel vroom'd to number one on Most Discussed! Thank you VERY much, Ape Fight! I`m very pleased to hear that! Quoting David Roberts I love how delicate the detailing on this quite large model is. I also like the neat touch of the fan as the flared end of the exhaust pipe. Thank you very much David, the fan at the end of the exhaustpipe is also one of my own favorite details! I love how delicate the detailing on this quite large model is. I also like the neat touch of the fan as the flared end of the exhaust pipe. Quoting Elk Guard Great job! Thank you very much Elk! Quoting gene 3S Beautiful! Chrome parts and the extended mirror are very cool! Merry Christmas! Thank you Gene, and Merry Christmas to you too! Beautiful! Chrome parts and the extended mirror are very cool! Merry Christmas! Thank you so much Jim! It`s always pure delight to read your comments, and it makes me feel quite proud. 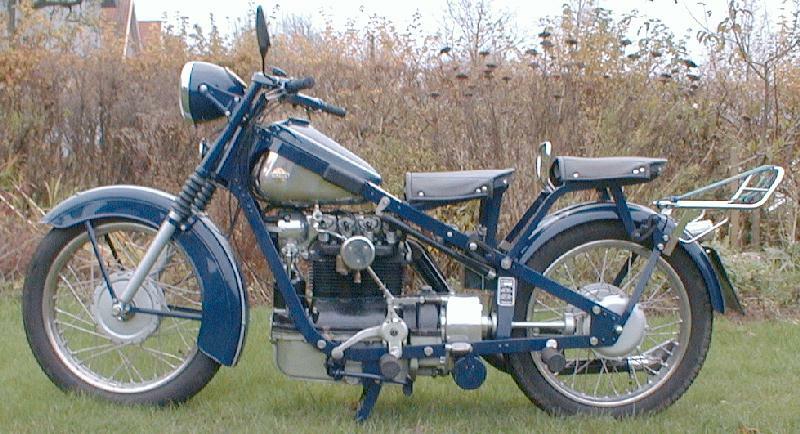 So now you know, Denmark did produce a motorbike, and actually many of those are still running today. You may be right, the driving experience may rely heavily on the quality of the saddle springs :-). Thanks again for stopping by, and happy holidays to you and your family too! Thank you very much Adam! Merry Christmas to you too! Quoting Jeremy McCreary Spectacular, Henrik -- especially the fenders! (You made the right decision there.) Happy Holidays! Thank you very much Jeremy! The fenders is probably the hardest thing to make look like the real ones. I think this solution, although the rubberbands are not Lego, is eatable to most Lego-fans. Happy holidays to you too! Quoting Gabor Pauler Mindblasting styling solutions, great work! Thank you very much Gabor, it`s very much appreciated! Quoting Per Bonde Hi Henrik. You have done it again! Just love it. In my childhood I lived next to the Post Museum in Vesterbro, Copenhagen. They had a yellow Nimbus as part of the exhibition. First thing to go through my mind when i saw this. Thank you for another interesting LEGO-year. Merry christmas and a happy new year to you and your family. Thank you very much Per! As we both are Danes the Nimbus will always mean something special to us. I did consider building a Postal-version with sidecar, but didn`t, because the yellow Lego color isn`t right for it. Thanks again for the comment, and I also wish you and your family Happy Holidays! Quoting Seaman SPb Excellent motorbike! Merry Christmas! Thank you very much Seaman, much appreciated! Merry Christmas to you too! Thank you very much Sven! I always try to avoid painting or modifying any LEGO part, but sometimes it`s the only way to a particular look. I don`t think it`s wrong to do so, because that`s exactly the same thing TLG does, when they don`t find a specific part in the existing LEGO palette, they just design a new element! Merry Christmas and happy holidays! Quoting Oran Cruzen Excellent! Sorry but I cannot give you a higher rating! Oh, wait a moment, I can! EXCELLENT+ There, a higher rating! LOL Lots and lots and lots, did I say lots?, of great detail! Merry Christmas to you and your family! Now I�ll be there Oran, seems like you`re very eager to have my response to your comment :-) Thank you so much dear LEGO-friend, I`m really glad to please you with my latest build. Merry Christmas and happy holidays to you and your family too! Excellent! Sorry but I cannot give you a higher rating! Oh, wait a moment, I can! EXCELLENT+ There, a higher rating! LOL Lots and lots and lots, did I say lots?, of great detail! Merry Christmas to you and your family! Thank you Ingmar, very much appreciated! Quoting A Taylor Superb work. It's very detailed and well done. Spectacular, Henrik -- especially the fenders! (You made the right decision there.) Happy Holidays! Mindblasting styling solutions, great work! Hi Henrik. You have done it again! Just love it. In my childhood I lived next to the Post Museum in Vesterbro, Copenhagen. They had a yellow Nimbus as part of the exhibition. First thing to go through my mind when i saw this. Thank you for another interesting LEGO-year. Merry christmas and a happy new year to you and your family. Superb work. It's very detailed and well done.